The Fiesta Island comfortably fits eight people. 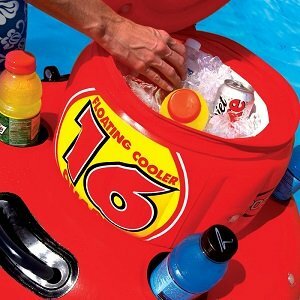 Use the included floating cooler by the raft, or detach it for easy portability. Party in the water or off the water. The Fiesta Private Island has room for eight with cup holders all around and a comfortable mesh bottom surface. You can enjoy the inflated contoured backrests in the water, or sit on the floating platform portion and just let your toes go for a dip. The improved construction of this inflatable lounge tube now includes a central air chamber for extra support. 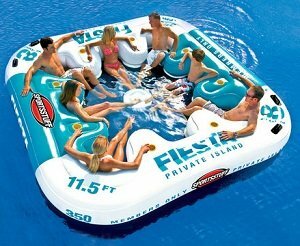 Not only does the Fiesta Island include the eight-person raft, but it also comes with a 16-quart inflatable floating cooler, so your favorite beverage is always nearby. Enjoy the cooler next to the Island, or detach it and use it wherever your adventures take you. The Fiesta is a party and anything goes! SPORTSSTUFF and AIRHEAD watersports products are manufactured by Kwik Tek, Inc., a Colorado corporation founded in 1991. AIRHEAD & SPORTSSTUFF products include inflatable towable tubes, wakeboards, kneeboards, water ski ropes, wakeboard ropes, tube tow ropes, tow harnesses, water skis, air pumps, inflation accessories and more.